Hi, all! It's Jessica, and I'm still around. My days have changed, however, and more often than not I'm behind a computer. An important detail is that I'm happily behind a computer. I'm loving the work I'm doing with Code for America and learning as much as I can. I can be found in coffee shops in SF and Oakland or at the fantastic office of ours at CfA. So, while I'm still making things, they contain strings in code more than strings of thread. But, I promise projects from me won't be disappear completely, they'll just happen when they do in this new schedule of mine, and whenever they do, they'll definitely be posted here. 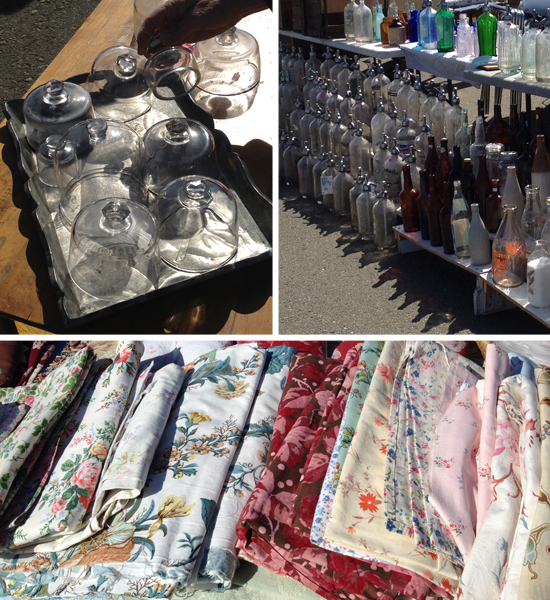 Moving on, I did go out to Alameda, an island just west of Oakland, to visit the antiques fair (or to them, faire). It's the first Sunday of every month. There is an admission to get in, which I thought was a little odd, but if you go around 10 (I know, late by antique market standards) it's just $5. The place is huge and if I weren't on my fellowship salary and basically already in possession of most things I need in my life right now, I would have gone to town. To. Town. I did pick up a couple things, though. I got 7 hankies, because I use hankies. Everyday. If you're in the area, it's definitely worth a go -- even just for the view of downtown San Francisco. Below you can see that we're not in Kansas. Oakland has a big port and these giant shipping crate dinosaurs provide the backdrop for rugs, old dressers and Fiestaware. I looove the Alameda flea market! Last time I was there, I went a bit nuts buying LIFE magazines from the 1930s-40s. I find the trick is to only bring as much cash as I'm willing to spend for the day—otherwise I'd go crazy buying up every cool thing I found! Oh that looks like SO much fun... My lovely hubby just missed out on a job coding for Cisco... Had we got it I'm sure we would have been travelling over from Australia, and this very faire would have been on my to-do list!